Caring for residents and clients with urinary incontinence can be frustrating for staff. Achieving sanitation requirements, managing client comfort and preserving furniture and flooring can be difficult priorities for a busy staff. Fortunately, there are ways to make dealing with incontinence easier through steps as easy as using furniture that is designed to make clean-ups less strenuous. In our three part series, we will walk you through furniture construction and fabric options that can relieve the stress of even heavy incontinence issues. 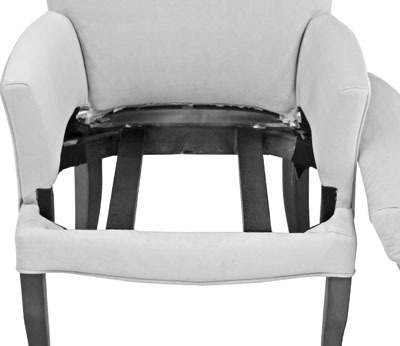 There is an exciting assortment of options for making upholstered furniture stand up to incontinence. The most recent development is pop-out seats. In pop-out construction the seat cushion is upholstered with a solid bottom – also called a solid deck. The solid deck, the foam core and spring unit are encased in upholstery giving the appearance of a typical seat cushion. However, the entire pop-out seat lifts easily out of the furniture frame to allow staff to mop under furniture without ever moving it. Pop-out seating pieces are additionally designed with a strategic slope that aids urine and other fluids down to the floor without collection on the seat itself.